Takashimizu history began in 1944 after merging of 12 small breweries during World War II. In this column, we will trace the history of 12 breweries which are the foundation of current Takashimizu one by one. We will introduce “Toshimagawa” this time as the eighth brewery out of 12. Masanosuke Okabe started sake brewing business in 1905 at Toyoshima village, current Kawabe area, Akita city. Sake brewing business itself started at late Meiji period, but as Okabe family, it is dating back to the end of Edo period. Masanosuke’s old brother “Shozo” was born in 1845 and until his death in 1918, he contributed to the development of education and local industry. At that time, Toyoshima village was flourished as a post town and Okabe family was taking a role of a village headman. During the Boshin war (1868-1869), they accommodated 9,000 soldiers of the Imperial army and supplied food to the battlefield at Tsubakidai at day and night. For this achievement, they were permitted the status of “Myoji-taito” (the right to bear a surname and to wear a sword). After that, they contributed considerably for the local development, and as a result, they won Ranju hosho (the Medal with Blue Ribbon) as a person of Local Autonomy Merit in 1901. Their brand “Toshimagawa” also developed firmly as well as the honorable history of Okabe family. They were rooted in the local community and expanded its market around Akita city. After Masanosuke’s son Shokichi succeeded, they continued sound management. Shokichi’s adopted son Masanori became the third president of Takashimizu later. The picture above is sake bottle, sake cup, money collecting bag, and label of Toshimagawa. 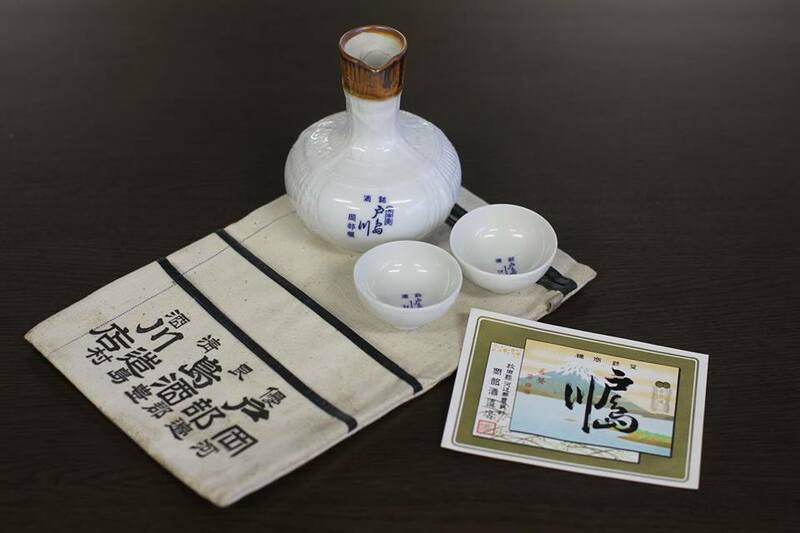 Both of sake bottle and label are such an elegant design, aren’t they? On the label, the word “名聲布四海” is printed in red ink and this means that the reputation spreads to the world.